Einar Hem, my father-in-law, passed away peacefully 7 days after his eldest son’s (my husband Hans Einar’s) 59th birthday. 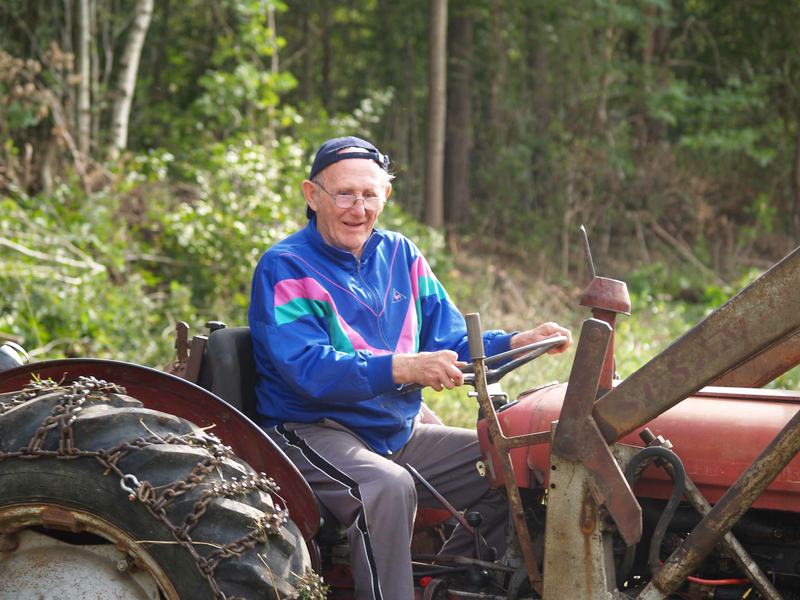 Einar was 90 years old when he died, having lived a full life, almost every single day of it spent on the farm where he was born. I live on that same farm and write this from the very room in which he was born, the first son of Klara and Hans Magnus Hem on 31 March 1923. While it is clear from the many tributes paid to him at his funeral that Einar lived a rich life in which he touched many, it is in his death that I have come to really understand the man he was. On the day the doctors told his wife, Alfhiild and Hans Einar that Einar was terminally ill, Hans Einar offered, and his mother accepted, that he and his two brothers would together make the decisions that had to be made regarding Einar’s treatment. Hans Einar then rang his two brothers, Torbjørn and Arnfinn, and they agreed that Einar would receive palliative care only; there would be no treatment for the illness as Einar’s 90-year-old body would probably not withstand surgery or any invasive treatment. Two days later, Einar was transferred from hospital to a nearby nursing home, where he was installed in a private room on a floor with 6 other patients and 3 nurses to look after them. Hans Einar and I were waiting when he when he arrived by ambulance at the nursing home and I sat with Einar while Hans Einar went to talk to the head nurse about Einar’s care. Einar had suffered from mild dementia for some time and was confused about where he was but was very aware of those around him and was polite and gentlemanly to all the nurses who came to look after him (he always did like attention!). Because of his dementia, Einar was not told of his diagnosis or prognosis while he was in hospital and there was agreement within his immediate family that he would be told when the opportunity presented itself. During the time Einar spent in the nursing home, he only asked one question: “Am I going to be here for an undetermined period of time?”, to which Hans Einar responded “yes, you are here for an undetermined period of time”. It was never clear to me if it was the dementia that prevented him from understanding what was really going on or if he understood at some level but preferred not to address the situation directly. The staff at the nursing home were kind and discreet. Visitors were asked to leave the room whenever they prepared Einar for bed or when he was being washed in the morning. The nurses always addressed Einar directly and it was only if he was unable to answer their questions that they turned to a family member. The staff not only cared for Einar, they cared for his visitors. Although Einar was not eating much at the time, his family and visitors were provided with platters of sandwiches for lunch and we were all welcome to serve ourselves from the hot dinner fare that was provided to patients. During the 5 days Einar spent at the nursing home, a member of his family was with him from mid-morning to late at night after he had drifted off to sleep. Alfhild was at his side every day, as were his sons and there were regular visits from those grandchildren who live nearby. There was never any agreed plan on who would come when, but there was always someone with him. There were no activities to fill his day; rather, his family simply sat with him, talked to him when he was awake or talked quietly to each other while he napped. There were tears and laughter and “hellos” and “goodbyes” and “see-you-tomorrows”, and with each utterance, we were acutely aware that it might be the last one. Einar died peacefully on 21 November 2013 at 6.30 a.m. By the time we arrived about an hour later, the staff had cleared his room of all clutter and Einar lay in his bed, lovingly prepared by the staff for his last visitors. The room was illuminated by a single candle that had been placed by his bedside next to a vase of roses. His family was able to be with him, uninterrupted, for as long as they wanted. The next few days were spent making practical arrangements for Einar’s funeral and receiving family and friends who came by to pay their condolences. The funeral service was a traditional one, held at the local church where Einar’s parents, grandparents and one of his siblings is buried. The church was filled with over 200 of Einar’s family and friends and, given his advanced age and the fact that many of his contemporaries have already passed, this was indeed an impressive turnout. Hans Einar gave a beautiful speech that touched on many of the highlights of Einar’s life: his birth (the first at the farm in over 40 years), the death of his father when he was only 7, his formidable athletic career and long-distance running times that make my half-marathon times seem like a slow walk, his meeting and marriage to Alfhild 59 years earlier, his life as a farmer (he was at his happiest while riding a tractor), his activities in the resistance during the war, his active participation in local politics and, perhaps most importantly to him, his life as a husband, a father, a father-in-law, a grandfather and a great-grandfather. At one point in the service, Einar’s grandchildren were invited to place a single red rose on his pine coffin. During the entire service, Einar’s youngest great-grandchild ran around the church, noisily reminding us of the energy of life at a time when we are so focused on death. Einar’s three sons and his eldest grandchildren bore his coffin out of the church. One of his granddaughters and I accompanied Alfhild behind the coffin and we stood outside in a light drizzle to receive the warm and heartfelt condolences of Einar’s community. I was touched by the presence of our friends and those of Torbjørn and Arnfinn who showed up to support us. Following the church service, everyone was invited to a reception with sandwiches, cake and coffee at a nearby hall. There were some lovely speeches about Einar, some tears and enough laughter to remind us all of Einar’s dry and witty sense of humour. As much as the funeral was a solemn moment to say goodbye, the reception was a celebration of Einar’s life. I already knew most of what was said about Einar, from his own stories and from the meticulous scrapbooks he maintained about the history of the farm. A few years ago, he asked Hans Einar to give him a photo of me so that I could be a part of that history, and so I am. But what these stories and archives do not capture is what, for me, has become the real testament to who Einar Hem was in life, and that is how he was treated in dying and in death: with kindness and respect, with little fuss, surrounded by his family, and with his final life decisions made by the children he raised to be both compassionate and practical. And, while I understand it, I am saddened that, in many cultures, dying and death have become so planned, so legal, so complicated. I have been lucky to be a part something different here at Hem and I am so grateful to Einar for that. A beautiful remembrance of a gentle man. In total antipathy to Einar’s wishes for his traditional funeral and in complete contrast to the simple, non-technological life he seems to have led, I am moved to send my condolences via a BLOG reply to Hans Einar and you, Roberta. Your simple words are a tribute to your father-in-law and show the love and respect that you have for him. From your words, I see that Einar lived a long and contented life. You were so lucky to have him there with you for so long, but I am certain that his absence will also be very present for you. I am so sorry for your loss. A lovely tribute to a lovely man. You are fortunate to be a part of such a caring family and they to have you. I’m so thankful you share such tender moments with us. So glad to have met Einar and the beautiful family that embrace you Roberta. I love you and my best to your family at Hem. A kind thoughtful tribute to a gentle man. I am humbled to have spent a small amount of time in his presence. Rest peacefully Einar. God bless you. Je t’ecris ici car il semble que ce soit l’endroit que tes amis ont choisi pour vous envoyer leurs sympathies, a Hans Einar et a toi. Pour avoir connu M. Hem, je suis d’autant plus touchee par son deces et par ton beau texte. Mes pensees sont avec vous en ce moment, sans oublier la chere maman de HE dont je me rappelle aussi avec beaucoup d’emotion. Thank you all for your lovely messages of admiration for Einar and your support of those of us who mourn his passing. Lovely to know that so many of you had the fortune to meet Einar. Very happy about that. My heart is full of pride, love and respect for the man that was your loving father-in-law. You have shown me that even though we were not there to be part of the farewell to Einar, reading your words made me realize that I was and am living those final days with a man that I had the honour of knowing. Roberta darling, Einar lives through your words and his legacy lives in his oldest son. Thank you for sharing so eloquently Einar’s final days. I love you for being who you are.